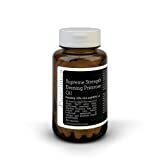 Supreme Strength Evening Primrose Oil 1000mg is a premium high strength essential fatty acid supplement providing 80% Linoleic Acid and 10% Gamma Linoleic Acid. At 1000mg and 80% concentrated, it is the strongest available. Standardised to ensure it contains exactly what the label states, each soft gel capsule provides an industry leading amount of the essential fatty acids Linoleic Acid (LA) 80% – 800mg – and Gamma Linoleic Acid 10% (GLA) 100mg. We’ve also packed in as much of the fatty acids, DHA and EPA, as possible. 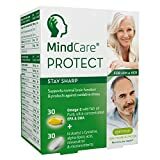 LA and GLA have been shown to help maintain healthy eyes, heart, and normal brain functioning, are indicated in the relief of hormonal changes, and reduce joint pain in doses as low as 500mg a day. Regular Evening Primrose capsules generally contain between 60% and 70% of the fatty acid Linoleic Acid (LA), and usually around 7% Gamma Linoleic Acid (GLA), making Supreme Strength Evening Primrose Oil 1000mg soft gel capsules approximately 10% stronger. Compared to Holland Barrett’s and Healthspan’s Evening Primrose Oil supplements, Supreme Strength Evening Primrose Oil 1000mg contains 10% more of the active fatty acids per soft gel capsule, making them stronger and more effective. The huge quantity of highly concentrated Evening Primrose Oil gives you the most potent Evening Primrose Oil possible for maximum results. 1. 1000mg of highly concentrated Evening Primrose Oil per capsule. 2. Mechanically pressed – not chemically extracted.